Review In A Nutshell: This is a great book for adventure lovers and people who are looking for a steamy romance with amazing characters and a thrilling plot. 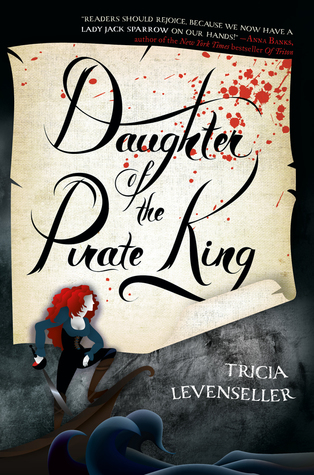 Daughter of the Pirate King takes place in a world filled with ruthless pirates who will do anything for control of the seas, and follows the Alosa, the daughter of the reigning pirate king. After she gets ‘captured’ by enemy pirates, she must try to discover their secrets in order to find the map to a legendary treasure. The only thing in her way- the attractive first mate who is assigned as her interrogator. This book is an extremely fun read, full of romance, action, adventure, and secrets. The world is vague, with the land politics and places not really mentioned, but life on the sea is shown in vivid descriptions. The plot is fast-paced, with plenty of suspense to add to the thrill. This book also has one twist that seems somewhat obvious, but then brings up with back to back surprises that completely threw me. The characters are all well developed, with great arcs and personalities that set them apart. Sometimes I did find the secondary pirates to kind of blur together, but the ones that you needed to pay attention to always stood out. I absolutely loved Alosa. She was cutthroat and unapologetically manipulative. She knew who she was and what she wanted, and she didn’t let anything stop her. Alosa was absolutely fascinating to read about, and probably one of the most badass female protagonists I’ve read. I feel like a lot of authors miss the target when they try to create strong women, and usually end up with annoying characters, but Alosa was one of the strongest, fiercest, and most compelling characters I’ve ever read. Riden was a really complex character, and I loved learning more about him through the book. It sets up for even more development in the sequel. The main relationship in the book is not only believable but just amazing and I absolutely loved it. Pros – Great writing, great characters, great plot, great setting, guys it’s really just great. This book was amazing. And now that I’ve read the sequel, I can say without a doubt that this a series you need to read.